After introducing the traditional ACLs in a recent post, let’s focus on an interesting approach offering significantly higher scale and better flexibility: the hybrid ACLs. That implies, only the systems equiped with external TCAM can be used here. It’s true for Qumran-MX, Jericho and Jericho+ based routers and line cards. 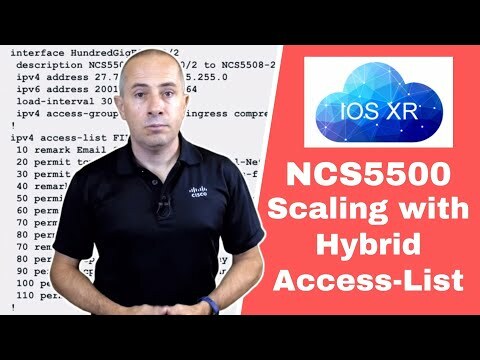 Hybrid ACLs can be used with IPv4 and IPv6 in ingress direction. So, L2 ACLs or L3 ICMP are not in the scope of this feature. It can not be applied in egress. Before jumping into the configuration aspects, let’s define the concept of object-groups: it’s a structure of data used to describe elements and called later in an access-list entry line (permit or deny). RP/0/RP0/CPU0:TME-5508-1-6.3.2(config)#object-group network ipv4 TEST ? RP/0/RP0/CPU0:TME-5508-1-6.3.2(config)#object-group network ipv6 TESTv6 ? These objects will be used in an access-list entry to describe the flow(s). Separating addresses and ports in two groups and calling these objects in access-list entries line offers an unique flexibility. It’s easy to create a matrix that would take dozens or even hundreds of lines if they were described one by one with traditional ACLs. Let’s imagine a case with email servers: 17 servers or networks and 8 ports. Adding one line in the object group for networks, it’s like we add 8 lines in a flat ACL. As you can see, it’s a very flexible way to manage your access-lists. It’s not necessary to remove the ACL from the interface to edit the content, it can be done “in-place” and without traffic impact. A portion of the eTCAM should be used to store a part ACL information (compressed or not). We took the decision starting from 6.3.2 onwards to let the carving decision to the user and no longer taking arbitrary 20% of the resource whether or not the operator decided to use this feature. result Rack graceful reload request on 0 acknowledged. Once reload is completed, you can check the external TCAM carving, it’s now ready for hybrid ACLs. For systems based on Jericho running 6.2.x and 6.3.1/6.3.1, 20% of the eTCAM is pre-allocated, even if you don’t plan to use hybrid ACLs. Nothing should be done if we decide to enable this feature. Hybrid ACL can be applied directly. No specific preparation needed. The verify option will permit to check if the compression happened correctly (expect “passed” in these lines). The DPA is the abstraction layer used for the programming of the hardware. You note the size of each object-group is one more than the number of entries. It’s always +1 for IPv4 and +3 for IPv6. The statistics can be also monitored. In this example, we don’t count permit ACLs (profile not enabled by default). Check the ACL entries in both engines. It’s possible to define object-based ACLs and apply them in non-eTCAM systems. They will be expanded and programmed in the internal TCAM. But it will not be possible to use the compression. Ranges are supported but within a limit of 24 range-IDs. It’s possible edit the object-groups in-place, without having to remove the acl from the interface. But an edition of netgroup or portgroup will force the replacement and reprogramming of the ACL. The counters will be reset. If packets are matching a permit entry in the ACL and are targeted to the router, they will be punted but not counted in the ACL “matches”. We hope we demonstrated the power of hybrid ACL for infrastructure security. They offer a lot of flexibility and huge scale. Definitely something you should consider for a greenfield deployment. Nevertheless, moving from existing traditional ACLs is not an easy task. It’s common to see networks with very large flat ACLs, poorly documented. The operators are usually very uncomfortable touching it. In these brownfield scenarios, it’s mandatory to start an entire project to redefine the flows that are allowed and forbidden through these routers and it could be a long process. Post Scriptum: the address ranges used in this article (183.13.x.y) are random numbers I picked. We are not sharing any real ACL from any real operator here. We could have picked the 192.0.2.0/24 but it would have made the examples less relevant.